If you are a newbie to blogging and join hands with Blogger platform, then you will be served a set of features to start blogging. As you move forward with blogging, you can do changes to your blog layout, edit template elements and change the design of your blog. But selecting your blog template is one of important milestone as you gonna lay your content on that template. You would be offered to select a template once when you start creating your blog with Blogger. But what if you change your mind and wanna select another template for your blog? Blogger doesn't prevent your from changing your template anytime. You can change your template if you don't like the one you have. If you just started blogging with your blog or haven't done many changes, then you are on the safe side. But if you have did blogging for quite some time and did massive modifications to your blog template, then you have to think again before take the action. Changing your blog template will discard your previous customization made to your template. If you foresee the advantage of changing template, then you can go for it. But make sure to back up your current template as a reference, in case if you wanna adopt changes in new template as you did on previous one by referencing to old template. 3. Jump to Template tab. 4. 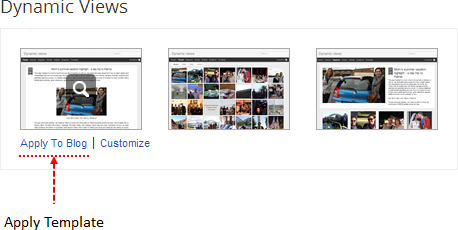 Now you can find the set of official Blogger templates beneath your live blog preview. Pick your favorite template and hover your mouse pointer over the template, and click Apply to Blog link beneath. * If you would like, now you can start customizing your blog template and personalize it as you need it to be. Start with fonts and colors. Read How to Customize Fonts and Colors in Your Blogger Template. You can customize your blog template via Template tab by clicking Customize button. Or use Edit HTML button to customize HTML codes of your template with your HTML knowledge. Layout tab will let you arrange your page elements too. Make sure to backup your template before make any changes. very useful. blogspot is not that user friendly. Only problem I have is this page VERY slow to load on slow connections. What template does this site use? 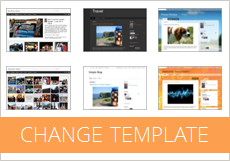 There are not that many blogger templates to choose from.